Actor Charlie Sheen is known for his role in the hit show “Two and a Half Men” as well as films such as “Wall Street”, “Machete Kills”, “Red Dawn” and many more. On Tuesday, November 17 he opened up to the world about his private life on screen. 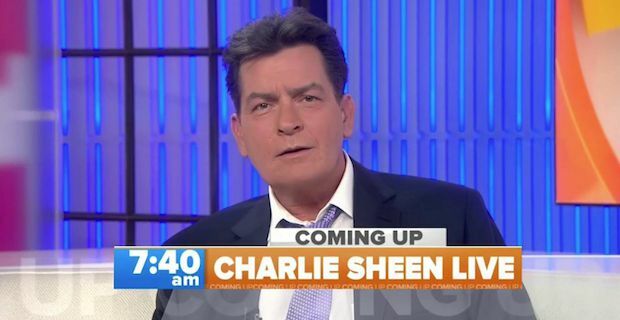 In a live interview on NBC’s TODAY show, Sheen talks to host Matt Lauer and reveals that he is HIV positive. Both him and his doctor, Dr. Huizenga, discuss his condition and what that does and does not mean. Human Immunodeficiency Virus (HIV) is not the same as AIDS, but neither have a complete cure. This virus though attacks the immune system killing off healthy white blood cells which are necessary for fighting off infections. Without WBC it is easier to fall victim to pneumonia or TB which can be fatal. Those with HIV though do have medicine that is available that helps fight off the virus, but needs to be taken throughout their entire life. Contrary to what many believe, people with HIV can live a full and long life. The 50-year-old actor had enough though and came out today about his HIV diagnosis to help “put a stop to this onslaught, this barrage of attacks and of sub-truths and very harmful and mercurial stories that are about me, threatening the health of so many others that couldn't be further from the truth."